While the PlayBook supports a plethora of various sensors like a gyroscope and a magnetometer (compass), hardly any developers have tapped into the latter. A new application has been produced by mappau OG, which utilizes the magnetometer in the BlackBerry PlayBook. 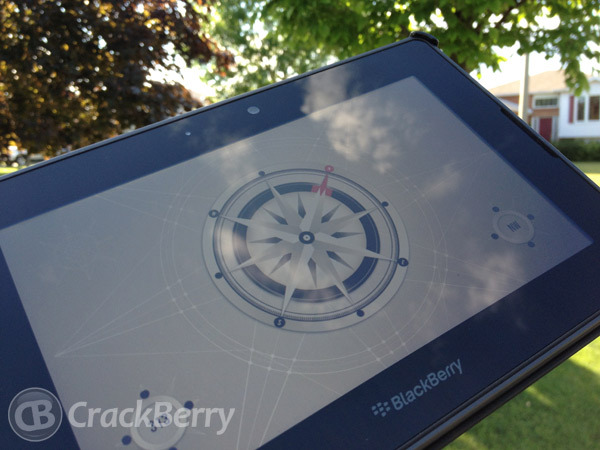 Compass for the BlackBerry PlayBook doesn’t require any movement or GPS pickup to show which direction you are traveling. Yesterday I went out on a drive to test the application out, and it works really well. One thing I did notice was that if you have a bulky case on your PlayBook the application may have a hard time locating your direction of travel, the developer also made a note of this in the App World listing. Also, you do not need to hold the tablet level; the compass will work if you’ve got it held in a car mount like the iGrip windshield mount we reviewed a little ways back. Compass for the BlackBerry PlayBook can be found in App World for the low price of 99 cents, and hopefully we’ll see the application make its way onto BlackBerry 10 phones later this year.